PUR FILL low expansion foam will seal and stop the passage of air, gases, water, dust, fibers, and sound into a building. Sealing air leaks also reduces the number of places than insects can use to enter a house. PUR FILL 1G foam is a rigid, low expanding, closed-cell foam that is applied with a foam gun. One 750 ml canister of either product will produce 2,820 cubic inches of cured foam, making 1,200 linear feet of 1/2" bead. It is tack-free in ten minutes and trimmable in thirty minutes. Foam consumption is reduced by 25 percent when using PUR FILL 1G compared to foam dispensed directly from an aerosol valve. 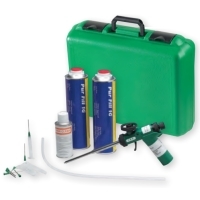 This Gun and Foam Starter Kit includes one Pageris Gun, two Canisters of PUR-FILL foam, Foam Gun Cleaner (4oz), six Needle Tips, and a convenient, durable plastic Carrying Case.